Flourless Raspberry Blondies. 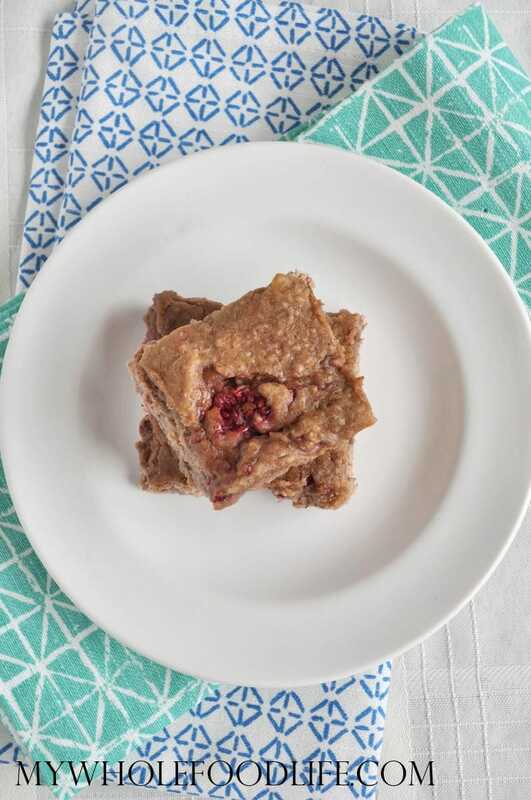 If you love my flourless blondies or brownies, then you will love this these flourless raspberry vegan blondies! I knew the recipe was going to be good, when I felt the urge to eat the batter with a spoon! Seriously! You need to try these blondies asap. These healthy blondies are vegan and gluten free. I think just about any berry will work in this recipe too. I just love raspberries, so that us what I made. We ate this batch in less than 2 days. It was that good! 1/2 cup cashew butter OR nut butter of choice. Sunflower butter will work too. In a food processor , add the chickpeas, cashew butter and coconut sugar. Blend for 1 minute or so, to get the mixture started. Then add all the remaining ingredients, except the raspberries, and blend until smooth. Lastly, add the raspberries and pulse a few times to mix them in well. Line an 8x8 baking dish with parchment paper. Leave some paper sticking out the sides. Pour the mixture into the baking dish. Bake for about 20 minutes. Let the blondies cool completely before removing from the pan. Slice into squares using a pizza cutter . These should last at least a few weeks in the fridge. They can also be frozen. Enjoy! Thank you!! These were so good!! I pretty much ate the whole batch myself. Hey Melissa these sound amazing and will be trying them soon. Can there be a substitution for the vanilla beans? What about vanilla extract? Thanks so much! Oh my, these look yummy! Did you use fresh or frozen raspberries? If frozen, did you thaw first? I'm never sure when the mushiness of the frozen berries will be a good thing or a bad thing when baking. Can't wait to try these! Thank you!! I used fresh. If you use frozen, let them thaw before using in this recipe. These sound AMAZING! Can't wait to try them. Thank you for all of the great recipes! Thanks Tracie! I hope you enjoy them! I really need to try this!!!!!!!! ASAP!!!!!!! Hi Melissa, these blondies look delicious! But my food processor doesn't work:( do you think I could mix it in my vitamix? Can't wait to make these! Thank you! Howdy!! Just wondering if I could use honey or steevia or something else for the coconut sugar because I live in a very small town and would have to order that for a ridiculous amount. Thanks! I love your site, just found it and can't wait to start making some things. Enjoyed this recipe! They made great breakfast bars. I cut the sugar to 1/4 cup and added extra lemon zest and they were great. Only thing is I wish I wouldn't have only pulsated the raspberries once because they ended up getting completely blended in with 3 pulses. I am glad you liked the recipe Carly! Good to know they work with even less sugar too. Hi! Mine came out a little bit like clay or plasticine inside, what's my mistake? Thanks! Oh no! :( I am not sure what happened. Hey! :) I just tried these and they're delicious, I've already eaten a whole row haha. The batter was sweeter and tangier without the salt so I'd omit it next time, but other than that this recipe is lovely!! You can try using quinoa flakes.